Smithsonian Earth offers unlimited access to stunning nature and wildlife documentaries and videos, all commercial-free. Explore the options. The app has a wonderful display of video-viewing choices. From the most popular and recently added to specific topics like the rainforest or baby animals, there is so much to explore. Once you select a video, you will see a brief description along with the run time and option to add it to your favorites. For those who live the great outdoors even when inside, this is the app for you. Featuring free and commercial-free videos, Smithsonian Earth is continuously updated to bring you the best that nature and wildlife has to offer. There are plenty of free video apps on the App Store. Few, however, offer commerical-free videos. Award-winning programming exclusively from Smithsonian Channel, available anywhere, anytime, and on your favorite devices. Stream original series and entertaining documentaries inspired by the Smithsonian Institution’s museums, research facilities, and publications, and explore worlds of history, mystery, science, pop culture, and more. No commitment or cable subscription required. Just download and enjoy at home or on-the-go. 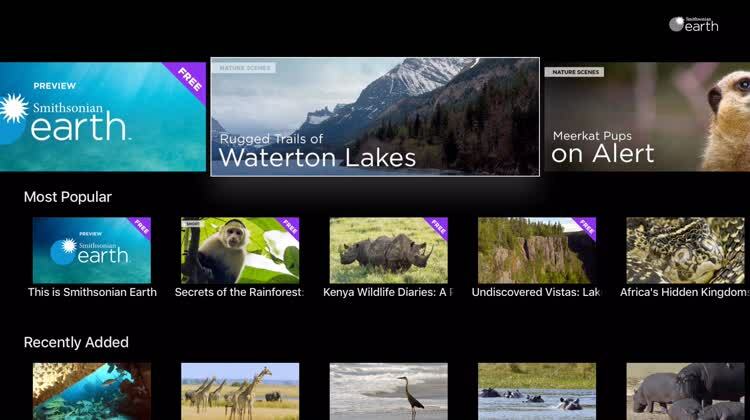 Upgrade to Smithsonian Channel Plus for an ad-free viewing experience. Unlock even more nonfiction entertainment, like full seasons of our most popular series Aerial America, America in Color, and Air Disasters, in addition to nature and wildlife programs from Smithsonian Earth. With new content added weekly, you'll never run out of genres to explore, worlds to discover, and things to learn! All for just $4.99/month after your FREE 7-day trial*. Now available on Apple TV®, iPhone® and iPad®. *You will not be charged for the SMITHSONIAN CHANNEL PLUS streaming service during the free trial period (the first 7 days of your subscription). TO CANCEL YOUR SUBSCRIPTION AND AVOID BEING CHARGED, YOU MUST CANCEL BEFORE THE END OF THE FREE TRIAL PERIOD. To keep your subscription once your trial period is over, you will not have to do anything. Free trial is available to new customers only. ©2018 SN Digital LLC All rights reserved. Smithsonian Channel is a trademark of Smithsonian Institution. SN Digital LLC is an authorized user. Smithsonian Channel Plus is accessible for viewing solely in the United States and its territories and possessions. Minimum high-speed broadband connection is required for viewing.